APC-7112 is based on the Samsung S3C2440A ARM9 processor and runs at 400MHz in industrial standard 3.5" form factor. APC-7112 features state of the art technology, aiming at low power systems that require high CPU performance and complete operating systems compared to micro-controllers. They also provide all the interfaces needed in a modern embedded device. With Debian Linux supported, users can easily migrate their original application from other platform or develop a new application on this platform. 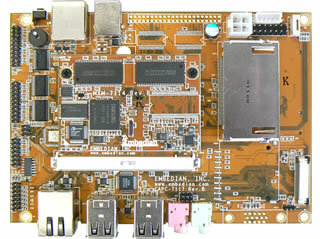 APC-7112 is also the first SBC that adopt MXM form factors as a core. APC-7112 SBCs provide glueless connectivity to passive and active LCDs with resolutions of up to 480x320, as well as 4-wire resistive touch screens. An integrated 16 bit stereo codec allows to play and record audio. In addition, APC-7112 offers 10/100 Mbps Ethernet as well as 6 RS232 ports and USB host and device functionality.